Born in Kokura, Fukuoka Prefecture, Ryoichi (Roy) Yamamoto began his career in Japan where he worked under two Chefs that still inspire him today. Yamamoto was a Sushi Chef at Genroku Sushi in Osaka, after learning how to make sushi at Den Sushi in Fukuoka, Japan. He gained his experience in Japanese cuisine at Saiwai-Tei in Fukuoka. For several years, while living in Fukuoka, Roy would dive and catch his own sea urchin and sea cucumbers in the ocean. He would get fresh fish at a nearby fishing village, and cook often while working as a broker. With the support of his wife, he moved to Osaka to attend the prestigious Abeno-Tsuji Culinary Institute. This school consulted the “Iron Chef” as well as many other popular TV shows. 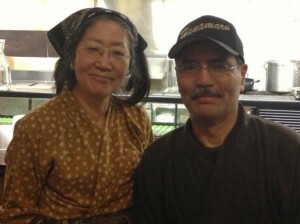 Yamamoto Sensei (which means Master, or Teacher) brings this extensive training and experience from Japan to his acclaimed restaurant, Hanamaru in Ogden. He has been teaching Japanese cuisine in the United States for a decade now. His wife, Miyako, often accompanies his classes by making small plates with lots of flavor over the course of his programs. For one class, Yamamoto found a sweet and tart apple he wanted to share and asked Miyako to prepare it for the class. (Laurie notes: this is very Japanese. The perfect pineapple in Tokyo can sell for over $75! Finding that special fruit is a true joy of the Japanese Chef, and involves not only timing but the perfect conditions to get the flavor and characteristics just right). Miyako cut two very thin slices, added a bit of napa cabbage and finished the apple in a honey yogurt dressing, which just delighted the entire class. Similar to a Waldorf salad, Miyako’s dish truly brought out the flavor of the Fuji Apple with a Japanese twist. Other dishes she made that night included a Japanese soup with authentic Japanese flavors, and a refreshing pomegranate dessert.